Good afternoon. Its such a lovely day here today! This morning my 2 year old daughter and I gardened and chased the chickens. We have two chickens that roam around our back yard and my daughter adores them. They are tame enough for her to catch and hold. Thankfully she is having a nap ... and I got some time to do some colouring. 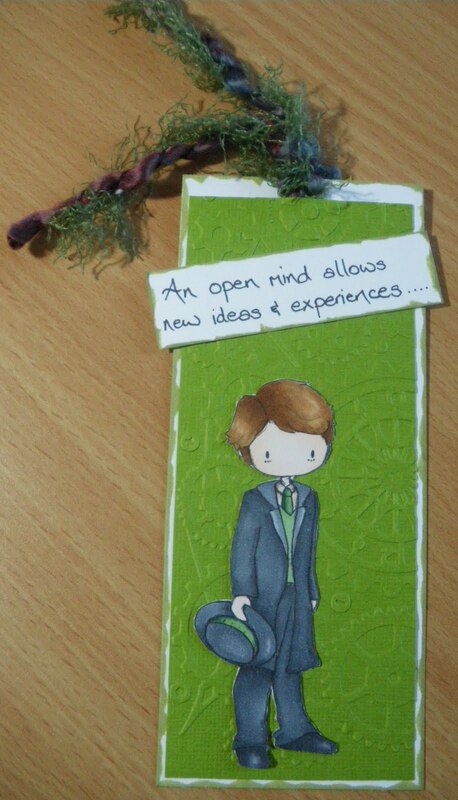 I have created a lovely bookmark. I'm thinking of sending this to my Dad for Father's day as he loves to read and is currently studying as well. I have used the superb Tiddly Inks Aiden image. I think he is just lovely and quite versatile. I have embossed the background using a cogs embossing folder as I thought it reflected the study of science and mechanical things and then ran some green ink around the white base card. I couldn't find a sentiment stamp that was suitable .. so I wrote my own. It is something that I say to myself often ... as it reminds me that to learn and experience things I have to be willing to listen and try. So without further waffle ... here is my bookmark. Hope to be back tonight :) I hope you are enjoying your day/night wherever you are. OH I love this - that embossing is fabulous and the paper that matches the accents on his clothes is perfect! Thanks for joining us at Tiddly Inks this week! hiyah carly!!! oh this is super hun, i love the greens and the sentiment and aidan looks fabulous,your dad will love it. 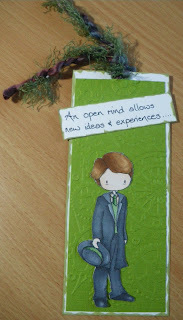 Great bookmark, a lovely image and great sentiment. What a wonderful bookmark, I agree, perfect for Father's Day. The embossing is such a nice touch! Glad you could join us at Tiddly Inks this week! This is a woinderful bookmark Carly. I love the embossed back round that you used. Thanks for playing with us this week at Going Grey with Scrap-Creations! Fabulous bookmark. Thanks so much for playing in this weeks Going Grey with Scrap-Creations Back to school challenge! What a fabulous bookmark !Even perfect for Father's day!Thanks for joining us at Scrap-Creations!